The First Person Arts Festival ends this weekend. 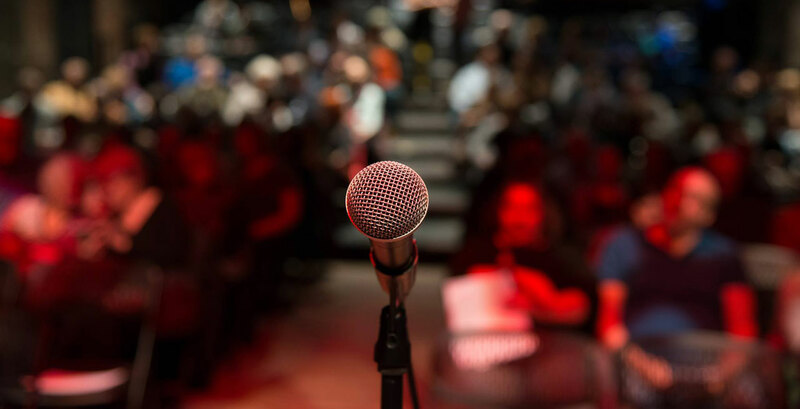 There have been weeks of personal story slams, spoken word performances, comedic showcases, a memoir writing class, and more at this artistic collective. Don’t miss your last chance to see this phenomenal artistic showcase. The 38th Annual Philadelphia Jewish Film Festival ends this Sunday. The cultural film celebration has been holding special screenings and panel discussions since the beginning of the month. Come see films from more than 20 countries from around the world. Don’t miss the shorts, documentaries, long features, and others. 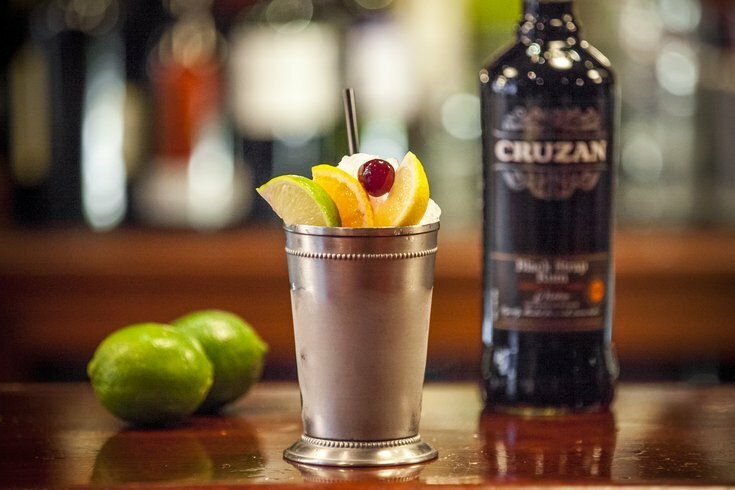 Manayunk Cocktail Week runs through this Sunday, November 18th. The annual cocktail celebration includes more than sixteen bars and restaurants in the Manayunk area. These participating locations will have stellar drink specials, seasonal cocktails, and brews celebration. 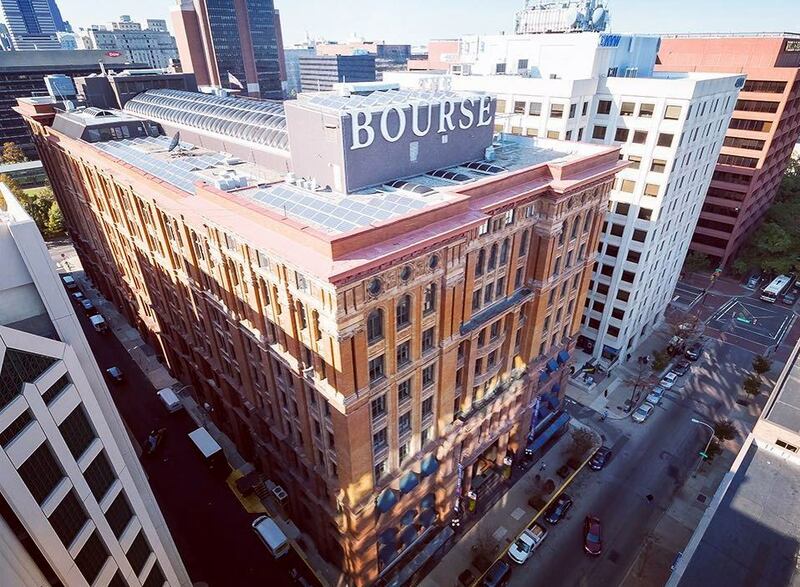 Where: The Bourse Food Hall, 111 S. Independence Mall E.
The Bourse Food Hall will be having its grand opening this week. There will be a ribbon-cutting ceremony this Thursday with Mayor Kenny and more. 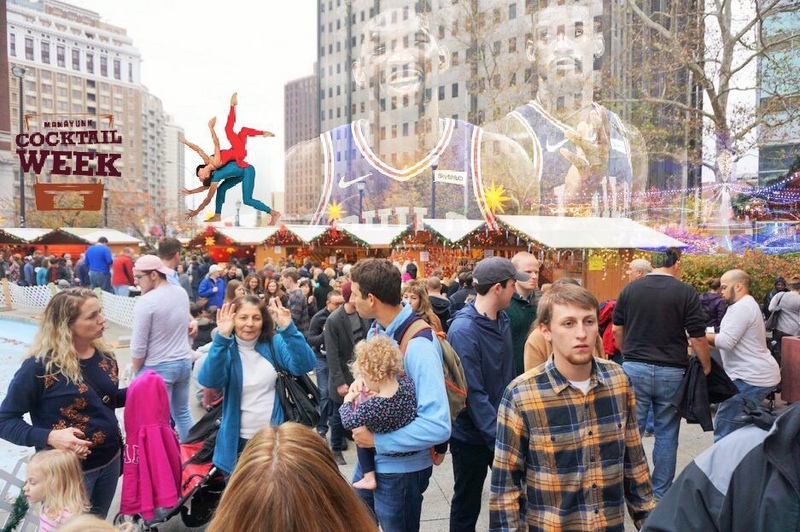 On Friday, Swoop and Philadelphia Eagles cheerleaders, a mini Mummers parade with the Quaker City String Band, acrobats and stilt walkers, and Philly’s beloved historical re-enactors such as Ben Franklin will be in the building. 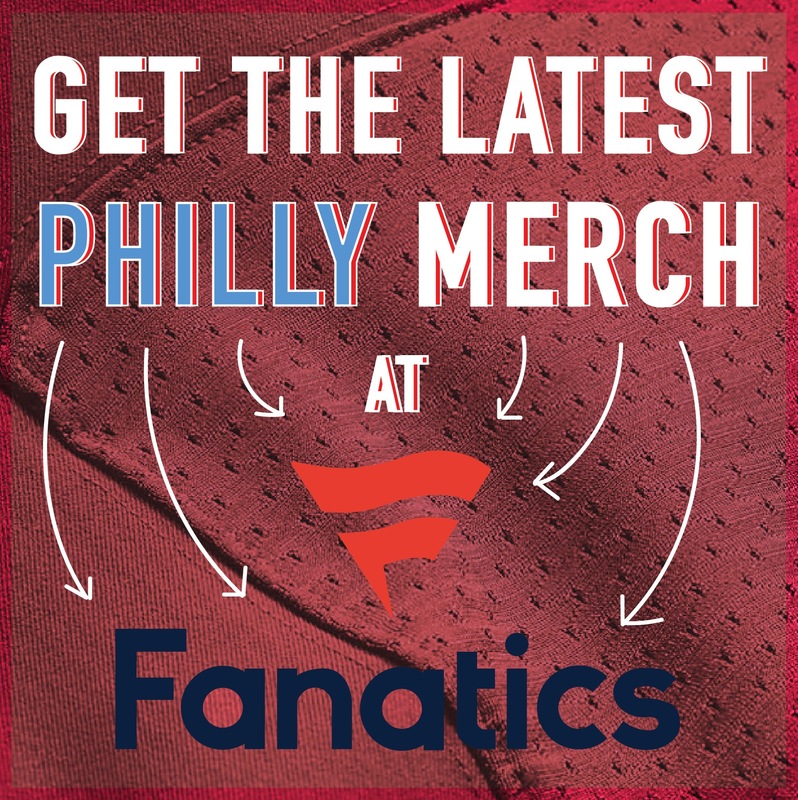 On both days there will be Flyers and Eagles tickets giveaways. Where: Franklin Square, 200 N. 6th St.
Each year Franklin Square gets transformed into a magical winter wonderland. The Franklin Square holiday festival includes this illuminating light show. Over 50,000 lights shimmer and glow to the soundtrack of your favorite holiday tunes. There are two alternating shows beginning every 30 minutes each day for free. Over 30,000 runners take their march each year in front of the Philadelphia Museum of Art to conquer The Philadelphia Marathon. There will be a full marathon, half marathon, and more taking over the city all weekend. Come out to participate or watch this amazing display of endurance, will, and athleticism. Where: The Franklin Institute, 222 N. 20th St.
“Are oysters really an aphrodisiac? Can you hack your taste buds?” These are a few questions that co-hosts Cynthia Graber and Nicola Twilley serve up on their award-winning food science podcast Gastropod. Stop by the Franklin Institute for an entertaining combination of live experiments, interactive tastings, field recordings, and more. The Kimmel Center’s floor will be booming with rhythmic talent and amazing choreography. PHILADANCO: Choreographers on the Move will feature the works of the former star of the Alvin Ailey Dance Company Christopher Huggins and Julliard instructor and director of the Jacob’s Pillow dance festival Milton Myers. Please come to this famed venue for a tremendous of dance. The popular comedy club Punch Line Philly will be the place to be this week. 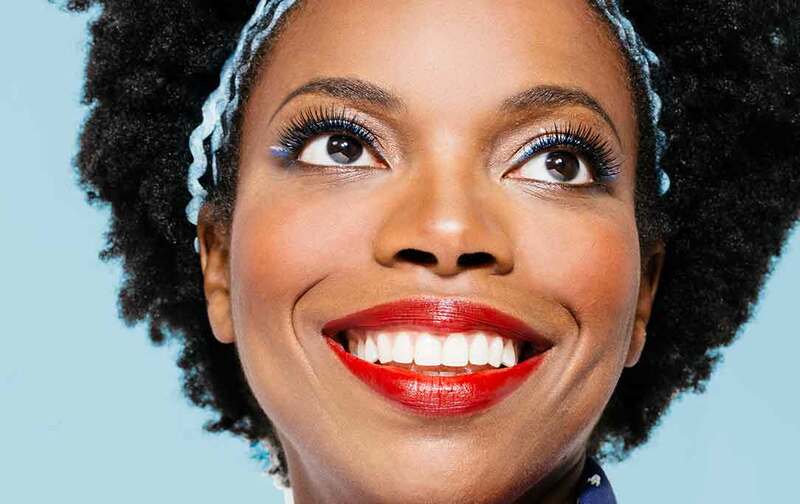 Sasheer Zamata will be performing a three-night stint at the laugh house. The SNL cast member fills the lounge with her charisma, comedic delivery, and hilarious jokes. Eight-time Grammy-winning musician and producer Stephen Marley will be playing at Keswick Theater in Glenside PA this Friday night. The extremely talented will be performing many of his countless hits at the frequented theater. Reggae fans will be out in droves to see this amazing talent. Before H.E.R.’s “Focus” was the musical backdrop for that famous Rihanna Instagram post or the songstress that took Daniel Ceaser’s “Best Part” to new heights, H.E.R. was a surging vocalist. Today she’s one of the best talents in R&B and is showcasing her signature sound on the I Used to Know Her Tour. Don’t miss your chance to see this songstress. The heavens have heard our clamoring and finally dropped another star in the City of Brotherly Love. The Wells Fargo Center will be electric as the 76ers take on the non Rookie of the Year, Donovan Mitchell, and the Utah Jazz. 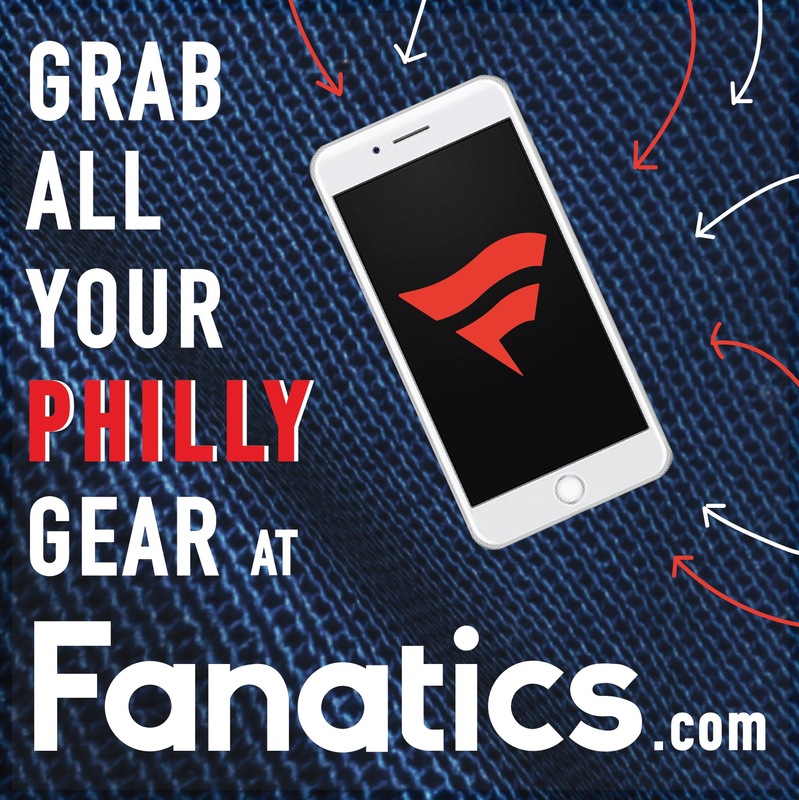 Come welcome Jimmy Butler to his new arena and watch the Sixers get their next win. The Please Touch Museum will be celebrating Thanksgiving early with this special and family-friendly event. This Saturday will be Family Festival: Friendsgiving. There will be a friendship zone, a feast, a creative arts studio, live performances, a parade, and more. Where: LOVE Park, 1599 John F. Kennedy Blvd. It’s that time of the year again. The edges of City Hall and the area around the revamped LOVE Park will be packed with many pop up wooden boutiques. The bustling mercantile village will have the best crafters in Philadelphia all in the same place. Come purchase your holiday gifts at this booming annual event peddling collectibles, art, jewelry, candles, food, beverages, lotions, and more. More than 40 local artisans, designers, crafters, and confectionaries will be on full display this season at the Made in Philadelphia Holiday Market. Complementing the adjacent Christmas Village, this free admission shopping area is the perfect place to find a treasure for your loved ones. The (3-4) Temple Owls will be taking on the (6-3) The South Florida Bulls this Saturday afternoon at Lincoln Financial Field. This will be the home finale for the local university. The matchup will be hard-fought as they face a conference foe. Continuing the local sports Saturday, the Philadelphia Flyers will be hitting the ice at the Wells Fargo Center this Saturday afternoon to take on the Tampa Bay Lightning. The Lightning are atop the Eastern Conference and have one of the best records in the NHL. The Flyers will need all the cheers and screams they can get for this battle. The Culinary Literacy Center and the Free Library of Philadelphia will be filled with the wonderful aroma of freshly made donuts this Saturday. Chef Matt Fein of Philly favorite Federal Donuts asks you to bring your family out for this donut-cooking demo lead. The young ones will be able to glaze, decorate, and gobble up their creations. Where: First Unitarian Church, 2125 Chestnut St. Formerly known as just Alex G, the Philly native has collaborated with Frank Ocean and several others. Last year he released his 7th studio album Rocket. The demand is high for this indie rock singer-songwriter. Be sure to get your tickets for his added show this Saturday night. The Flyers Wives Carnival is an annual charity event that always excites each year. The community gathering will have Flyers players, management, and media personalities all in attendance. There will be family friendly rides, games, and attractions at this amusing and larger-than-life party. Where: Merriam Theater, 250 S Broad St. There will be a special screening of Napoleon Dynamite this Sunday night. Following the famous feature, get ready for a moderated discussion with the film’s stars Jon Heder (Napoleon), Efren Ramirez (Pedro) and Tina Majorino (Deb). Retro Soul group The Suffers will be playing at World Cafe Live this weekend. Spin Magazine called them “the sort of neo-retro group you never knew music was so badly missing”. Helmed by the great vocals of Kam Franklin, this ensemble has all the tools to make you dance your Sunday night away. Where: Theatre of The Living Arts, 334 South St.
Hip-hop act and rapper Bas will be playing at the TLA this Sunday night. The Dreamville and J. Cole groomed act released his third studio album Milky Way in August. The project featured J. Cole, ASAP Ferg, Ari Lennox, and others. In a few weeks, the 23rd Street Armory will be filled with a tremendous craft beer selection and several festive cocktails. The Philadelphia ‘Winter Warmup’ will feature three drinking sessions of winter brews and seasonal beverages. There will be 30+ breweries and 15+ specialty drinks on location. The lively event will also have food trucks, entertainment, fun activities and games, and plenty more. There will also be a winter coat drive hose less fortunate this cold, winter season. This will be an amazing and exciting sampling event that you don’t want to miss.